San Diego Races You Don't Want To Miss! San Diego Races You Don’t Want To Miss! With our gorgeous year-round weather and variety of terrain throughout the region, it is no wonder that San Diegan’s are some of the most active people in the USA. And while many of us choose that activity to be surfing, biking, jogging, swimming or some other leisurely pursuit, some San Diegan’s like to push their competitive limits by participating in one (or many) of the numerous races that are held throughout San Diego each year. As an avid mud runner myself, I’m excited to be taking on my 3rd Super Spartan Race at the end of the month. Nothing quite gets my blood pumping like crawling through mud under barbed wire, pushing my way through a gauntlet of defenders or perfecting my javelin throwing skills. Here’s more information on the Spartan Race and several other upcoming San Diego races that are guaranteed to get you dirty, wet and beaming from ear to ear! 8+ mile Mud Run course through the Temecula hills. 20+ obstacles including climbing over walls or through tunnels, balance challenges and jumping over fire. Are you tough enough to make it through the Super Gladiator race? 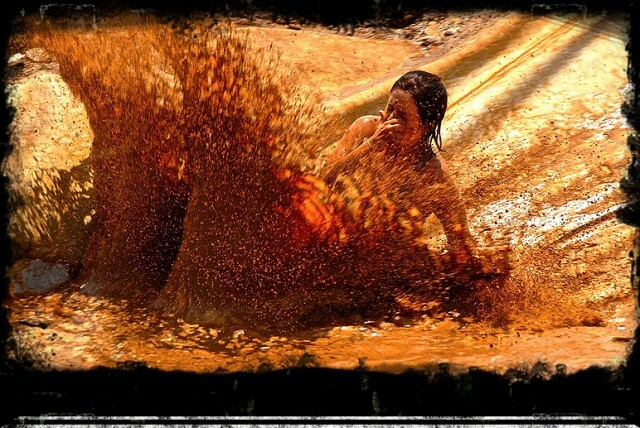 This 5-mile, 25 obstacle mud run course is the biggest, baddest, muddiest Gladiator event yet! They claim to have more obstacles per mile than any other race in the planet – and I’m looking forward to seeing if that is true! Climb sheer walls, slither across muddy fields and rocket down a 150 foot water slide into a pool of mud – who wouldn’t like to do that?! A 5k “Fun Run” with 12 larger than life, game show inspired obstacles including the Wrecking Ball, World’s Largest Inflatable Water Slide and Jumping Balls. Many participants dress up in costume and this is meant to be a fun time with your friends. I’ve done this race 3 times and highly recommend it – a San Diego race that everyone can have fun doing! 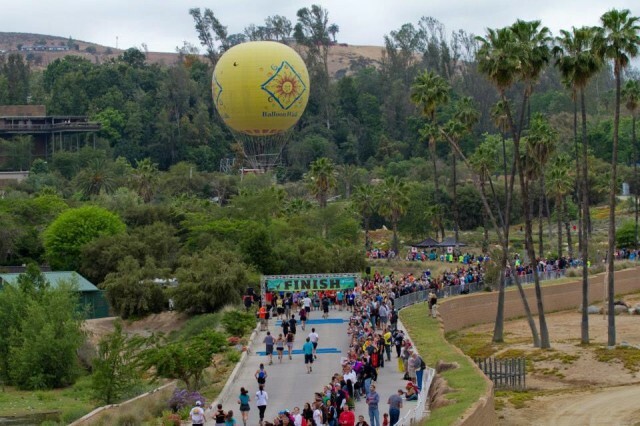 This scenic half marathon course winds its way through some of the most beautiful areas of Rancho Santa Fe. One of America’s oldest half marathons, the San Dieguito is celebrating 46 years this year! Are you prepared to take on the Torrey Pines “Mountain” climb? Race #2 of the Half Marathon Triple Crown, the La Jolla Half Marathon features a gorgeous run along the La Jolla coast, a challenging incline up to the summit of Torrey Pines State Park and then through picturesque La Jolla Shores where it finishes at the La Jolla Cove. Starting at the Westfield North County Mall, this half marathon ends inside the Safari Park. Runners will not only experience the fun of running past vineyards, horse farms and golf resorts, but they’ll also run through some of the Safari Park’s behind-the-scenes areas. Not only will they see animals along their run, but participants will also get to stay to explore the park after the race is over! So whether you’re a racer looking for a new location to run, a visitor looking for a unique San Diego experience, or a local who’s out to spice things up a little, I encourage you to get out and enjoy some San Diego races. Your body will thank you! This entry was posted in Attractions, Outdoor Adventures, San Diego Events and tagged half marathon, marathon, mud run, race, races, run, running by Benjamin Eastman. Bookmark the permalink. I lead a pretty active lifestyle and try to spend as much time outdoors as possible. On any given Saturday morning you'll find me on one of San Diego's beach volleyball courts and quite possibly on the water or a hiking trail at some other point during the weekend. As a single professional I definitely enjoy experiencing the nightlife throughout the county - but lean more towards the Gaslamp Quarter, North Park or Hillcrest when planning a night out. I love to eat, and try to keep my ear to the grapevine about new and exciting restaurant openings. And while I'm certainly excited to try the latest, trendiest restaurant in town, I am also infamously known for late night trips to 24-hour taco shops. Basically, whether I'm in board shorts or a bow tie, I try to enjoy all the many opportunities available to me in San Diego!What would you do on your ideal San Diego day?I’d start with a leisurely, late morning brunch. Spend some time on the beach. Grab some rolled tacos at a taco stand and then grab a nap. In the evening I’d hit the Gaslamp District for dinner and then end the night at a rooftop bar/lounge.If you were invisible, where would you go?If I got to pick a superpower, I don’t know that I would pick invisibility…but if I were to become Mr. Invisible, I guess I would go to all the live music, theater and symphony performances in town.What is your favorite San Diego outdoor activity?On a beautiful, San Diego day there is nothing better than playing beach volleyball. The sun on your back, a gentle ocean breeze, and a whole lot of bump, set, spiking! And of course the perfect day of beach volleyball isn't complete without a grill to barbeque some burgers or carne asada on.Do you prefer burgers and beer or linguine and red wine?Both actually! That’s the beauty of the San Diego food scene. I CAN have my cake and eat it too! Depending on my mood (and my finances!) I am happy to chow down at a hole-in-the-wall neighborhood burger joint or a luxury steakhouse. I'm actually a founding member of a Burger lunch group that eats at a different burger restaurant each month. We've been going for 6 months now and still have plenty of locations to visit before we exhaust all our options!